I am a natural builder. That means I build things using natural materials, primarily straw, clay, wood, and stone. I love working with these materials, learning a little bit more about them every time, and sharing that knowledge with others. I grew up on a construction site. Our family home was continually under construction by my architect father, and I learned the basics of carpentry at a young age. Later I got a degree in Environmental Science and Engineering at MIT. After college, I spent two years volunteering with a sustainable forest management project in Costa Rica. In 1993, all these threads came together when I helped start the Cob Cottage Company in Oregon. 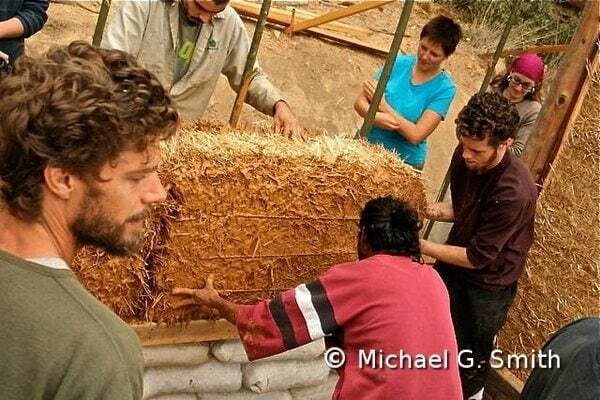 Along with co-directors Ianto Evans and Linda Smiley, we revived the tradition of cob building that had been dormant in the United States for 150 years and in Britain for half as long. During the next five years I traveled widely around the Western states, teaching cob workshops at dozens of sites and meeting many other builders along the way. In 1994, we convened the first Alternative Building Colloquium, renamed the Natural Building Colloquium the following year. That was an exciting time, with many new and ancient building systems weaving together to form the fabric we now call natural building. Here is an interview about my work with Cob Cottage Company. In 1999, I moved to Emerald Earth Sanctuary, an intentional community and learning center in coastal northern California. Over the next twelve years I helped build the community’s infrastructure, including fifteen natural buildings ranging in size from composting outhouses to a 3,000 s.f. community center, as well as gardens, orchards, roads and paths, water and electrical systems. It was eye-opening to live for a decade in a natural home I built myself. I learned a lot from that experience about the importance of good design and detailing, as well as how to plan for maintenance and remodeling. I wrote my first book in 1998, a how-to cob construction manual called “The Cobber’s Companion” (now out of print). Later I co-authored “The Hand-Sculpted House” (Chelsea Green, 2002) and “The Art of Natural Building” (New Society, 2002). I have contributed articles on natural building to several other books and many magazines and journals. For over ten years, I have been the expert on both cob and straw clay on Green Home Building, where all of my previous questions and answers are archived. I currently serve on the Boards of Directors of The Natural Building Network and The Cob Research Institute.